This energy of the city, its growth, commerce and industry were comprehensively photographed by photographers such as Ralph Snowball. By the end of the 19th century Newcastle was a bustling city with significant stone buildings, hotels with broad verandas and a thriving commercial centre. This exhibition to reconstruct Victorian Newcastle, by Tessa, Nicholas, and Helen from the School of Architecture and Built Environment, the University of Newcastle, is intended to bring the late 19th century city alive. 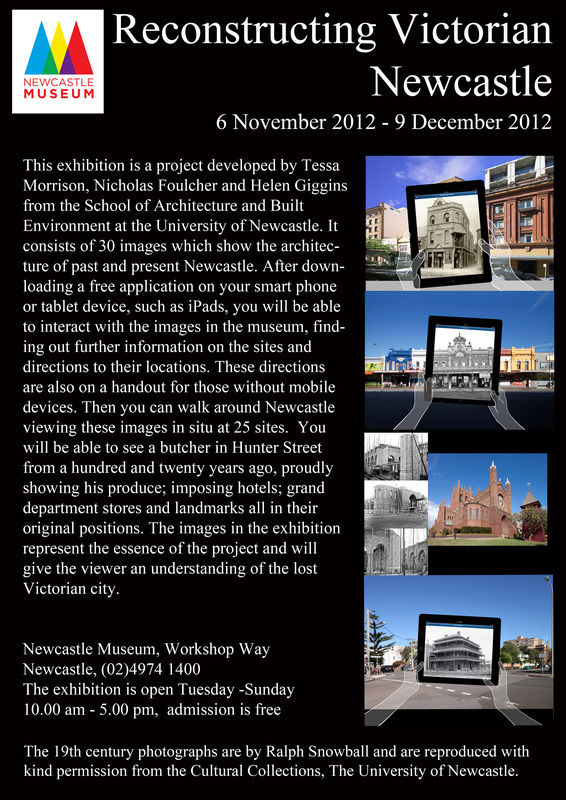 The exhibition consists of 30 images which show the architecture of past and present Newcastle. After downloading a free application on your smart phone or tablet device, such as iPads, you will be able to interact with the images in the museum, finding out further information on the sites and directions to their locations. These directions are also on a handout for those without mobile devices. Then you can walk around Newcastle viewing these images in situ at 25 sites. You will be able to see a butcher in Hunter Street from a hundred and twenty years ago, proudly showing his produce; imposing hotels; grand department stores and landmarks all in their original positions. The images in the exhibition represent the essence of the project and will give the viewer an understanding of the lost Victorian city. This project is a pilot project which has been funded by the Faculty of Engineering and Built Environment, The University of Newcastle. Newcastle has had a diverse history with its architecture that reflects its booms and busts. There are three distinct periods in the city: the convict city; the Victorian city and the modernisation of the 1950s and 1960s. Toll House is all that remains of the convict city. The Victorian city was Newcastle’s heyday. However, although there are some significant buildings that still remain in the city, and many more that have been altered or demolished in the move to modernise the city in the 1950 and 1960s. 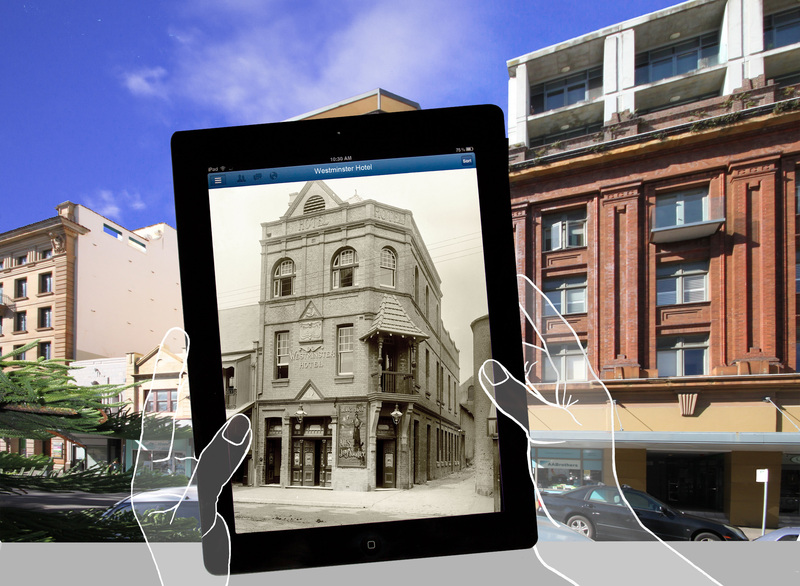 This Project has reconstructed central Victorian Newcastle using Augmented Reality and mobile technology. If you have a smartphone, iphone or ipad, download a free app from the app store called Layar. Once downloaded scan the image above to try out the program.